Don’t miss out – visit us at Bett 2019 and join our 30th birthday celebrations! 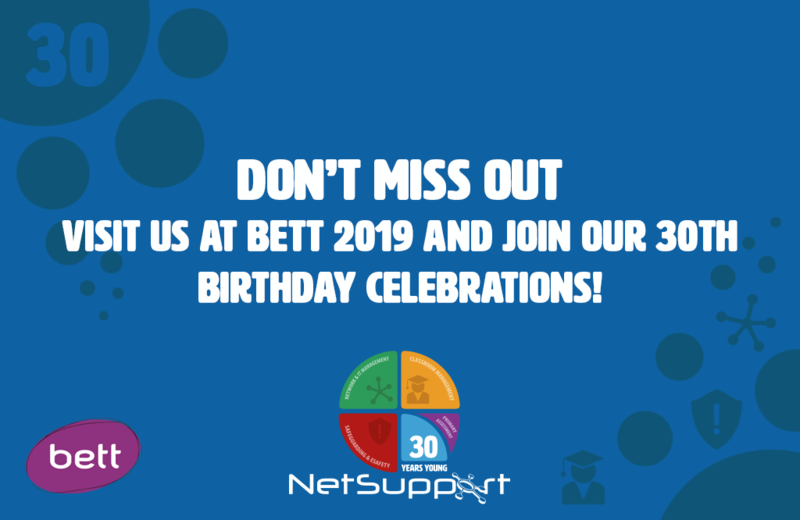 To help celebrate NetSupport’s 30th anniversary of providing award-winning school IT management solutions, we will be hosting a range of activities on our two stands: D120 and D130 at Bett 2019 (ExCeL London, 23rd to 26th Jan). Presenter zone – Listen every day to a range of industry experts covering edtech topics in bitesize portions. Check out our speaker programme to see which sessions you would like to drop by for. Discover new solutions and features – Get a first look at the latest features being released into our education solutions at Bett and get a personalised demonstration from the team on any of our products. NetSupport Radio – Bett legend and Schools Radio broadcaster Russell Prue is back to host NetSupport Radio, bringing you an exciting mix of entertaining and informative interviews from top celebrity guests, music, chat and interactive slots where you can join in live through social media. Special guests – Also joining us is the Association of Network Managers in Education (ANME), the free networking association for school IT staff. Meanwhile, teachers and safeguarding leads can learn more about GoBubble, the free social media app for under 13s that encourages positive digital behaviour. There’s only one way not to miss out and that’s to come to Bett 2019 at ExCeL London, 23rd to 26th January 2019! Click here to see where our stands are so you don’t miss us.